Manila, Philippines - Leading TV network in the country, ABS-CBN is set to launch its Christmas Station ID 2013 on Wednesday, November 6 after TV Patrol. Announcement made thru a video published on Youtube for ABS-CBN Christmas Station ID recording sessions which were led by "The Voice of the Philippines" coaches. ABS-CBN Christmas Station ID 2013 has a theme of "Magkasama Tayo sa Kwento ng Pasko". ABS-CBN said that this year's theme is all about reality, genuine emotions and stories close to the hearts of ABS-CBN and our Kapamilya stars. Three of the coaches of The Voice PH (Sarah Geronimo, Lea Salonga and Bamboo Mañalac) and the top 4 finalists (Janice, Myk, Klarisse and Mitoy) were given the opportunity to perform Christmas station ID 2013. "We as a network are happy to say that for the past 60 years, we have witnessed and are part of the many milestones in the lives of our viewers. Our audience has given us inspiration and in return we want to give back. By reaching out to our Kapamilyas all over the world. We have been in each others lives for the past 60 years and we will continue to be together in the years to come. ", ABS-CBN said in a statement. Brilliant artists collaborate for the newest Christmas Station ID: Robert Labayen for the lyrics, Jumbo "Bojam" De Belen for the music with Peewee Gonzales and Melo Saliendra directed the recording. Meanwhile, PhilPop 2013 winners Thyro Alfaro and Yumi Lacsamana also have participation for the music video. 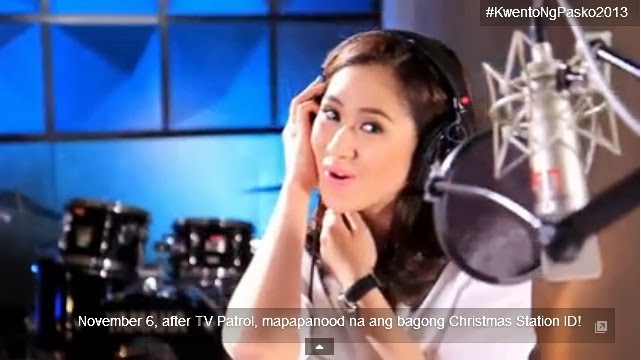 Video below is shows ABS-CBN Christmas Station ID 2013 Recording Sessions. For several years, the songs featured in ABS-CBN's Christmas station IDs have become big hits among Filipinos during the holidays. Some of the Kapamilya network' Christmas station ID that inspired Filipinos are "Bro, Ikaw ang Star ng Pasko," the Kapamilya network's Christmas theme song in 2009; "Ngayong Pasko Magniningning ang Pilipino" (2010), which took on the themes of community and dreams; and "Da Best ang Pasko ng Pilipino" (2011), which highlighted the thriving relationships between overseas Filipino wokers (OFW) and their families despite great distances; and “Lumiliwanag ang Mundo sa Kwento ng Pasko” (2012), which highlighted how the Filipino spirit always shines through despite the many calamities that have hit the country.